Before Economics it was The School of Business, but the current Economics Building was originally designed to be the Memorial Student Union. The building was one of the 15 designed by the Philadelphia firm of Day and Klauder. The buildings designed by Charles Z. Klauder between 1918 and 1939 for the campus are referred to as Tuscan Vernacular. 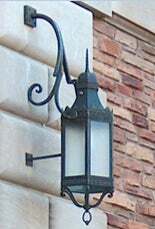 While the buildings are influenced by Tuscan architecture, he designed them to be unique to the Boulder area by blending them with the mountain backdrop and using local sandstone. Key features of his designs are multi-hued sandstone walls from local quarries, red tile roofs, limestone framed openings, and black wrought iron accents such as the outdoor lamps at the front entrance. In 1953 the new University Memorial Center (UMC) opened and renovations began on the old Memorial Student Union to turn it into The School of Business. In 1954 the two story Grand Ballroom was destroyed and a third floor added at the mezzanine level between the balconies. The building was home to The School of Business for many years before it was renovated again and became the new home of the Economics Department in 1971. Fireplaces remain in the basement and first floor as well as many signs of the original wood trim, doors, and paneling throughout. Of course the original marble memorial remains, but the mezzanine level is a complete third floor. Currently, the most notable feature of the building is still the beautiful memorial. As you walk up to the northwest entrance, you will see the word "RESPECT" in red stone placed in the sidewalk and the word "MEMORIA" (Latin for "memory") over the door. Inside the first set of doors the walls and floor are covered with marble. 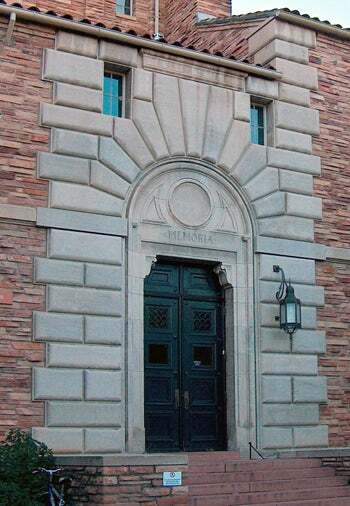 Names of fallen WWI soldiers from Colorado, Utah, and Montana appear on the walls under their state seals and the university seal. 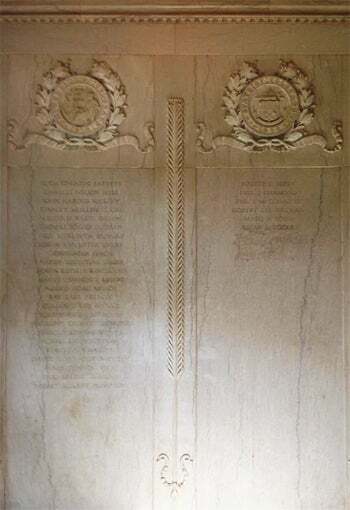 A stone set in the center of the floor reads "1917 REMEMBER 1918" and above the second set of doors are the words "This memorial is dedicated by the sons and daughters of Colorado to their brothers who gave their all in the Great War." For more about the history of the Economics Department, please read 2006: Celebrating 50 Years of the Economics Department by Keith Maskus. 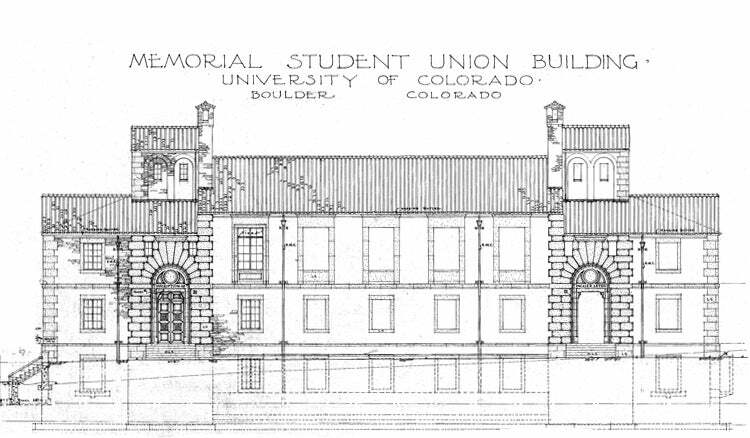 You can find out more about the history of the campus at the Campus Master Plan and the CU Heritage Center. 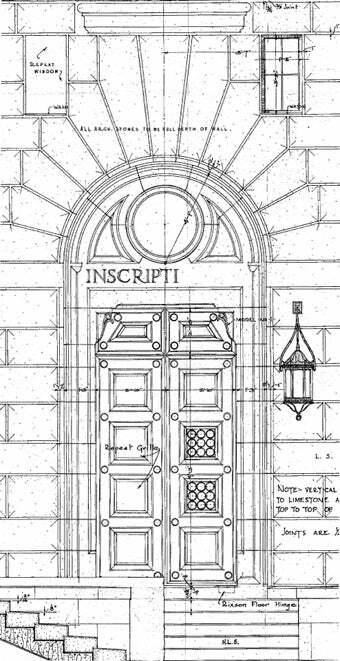 Drawings are details from the original plans for the building, 1927, by Charles Z. Klauder of the Day and Klauder firm.